Adaptable wire storage systems make life easier when workspaces grow, shrink, or require rearrangement. Versatility in food service and production, hotels, production floors, and more requires durable, cross-functional storage in hot, cold, and humid environments. Chrome is a plating process which deposits hard chrome over a copper, nickel surface. This process is very durable and is used in storage or material handling applications in any dry storage environment. 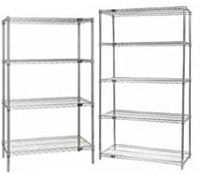 Quantum wire racks offer 4-tier or 5-tier configurations with height adjustable posts and shelves. Create custom modular racks and double the storage capacity of an existing wire shelving unit with a kit containing shelves, two posts and eight s-hooks. Connect multiple shelving units for back-to-back, side-by-side, U-shape, L-shape, and C-shape configurations when storage needs change. 54" height chrome wire starter unit. Consists of 4 posts and your choice of 4 or 5 shelves. 63" height chrome wire starter unit. Consists of 4 posts and your choice of 4 or 5 shelves. 74" height chrome wire starter unit. Consists of 4 posts and your choice of 4 or 5 shelves. 86" height chrome wire starter unit. Consists of 4 posts and your choice of 4 or 5 shelves. Do check the shelving capacity. All Quantum wire shelves offer a weight capacity of 600 or 800 lbs. Ensure the listed shelving capacity is listed per shelf, not the total shelving rack capacity. Do check for warranty information. Quantum stainless steel wire shelving features a lifetime warranty, green epoxy has a 15-year warranty and black epoxy has a 10-year warranty.